In what situations (from every part of life) can this competence (spotting opportunities) be fostered? Suggest ways for your school to support the empowerment of students in spotting opportunities. The more I think about it the more I get confused on how to reply. Entrepreneurship is very often associated with identifying problems, needs, and coming up with creative solutions for the benefit of others. Often, entrepreneurship minds bring the attention of others to needs and opportunities that they have not considered before by trying to look at things from various perspectives. Sometimes we do not spot opportunities because we are not used to see things from a different perspective. So I think that helping students develop the ability to see things from a different perspective must begin in the early school years (pre-primary and primary school), through play and funny activities. The "what is like to be a ...." activity can offer a lot. Changing roles and imagining. Can this be implemented in schools on a daily basis? Growing up, these students will be able to spot opportunities. Connecting subjects with real life situations, spending more time outdoors instead of staying in the classroom, allowing free expression of ideas, giving the speech to students can foster this competence. We just need to create the frame to express it. I would like to see thematic "ideas that matter" school contests, innovative students councils' initiatives, "walk in my shoes" projects. The QR codes that are mentioned offer an attractive to students means. I can't think of something more specific at the moment but I'll keep reflecting. 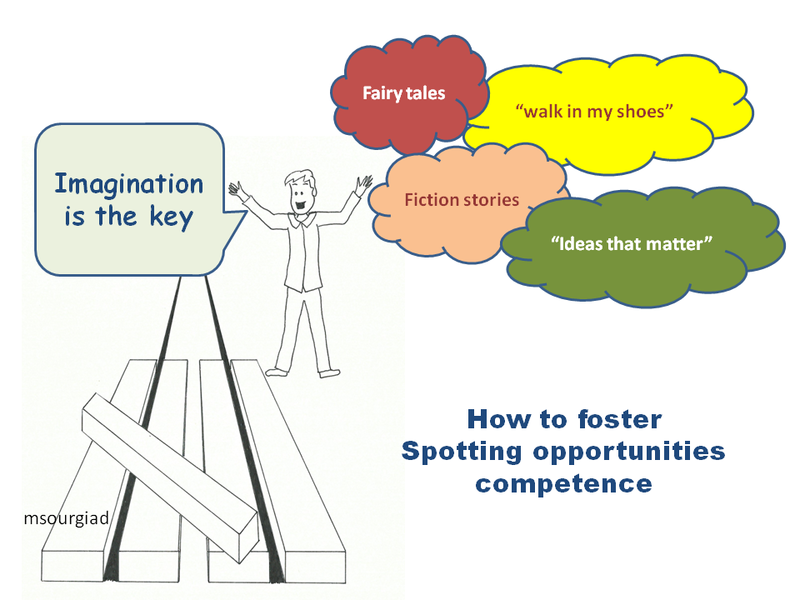 Final thought...how important is imagination in spotting opportunities? Imagine, close your eyes and create in your mind something that doesn't exist. Isn't it obvious that reading fairy tales in early years and fiction stories later on, help imagination grow so that the ability of taking a different perspective to things and situations is fostered?